Your service business is growing—awesome! You’ve landed new clients, you have more jobs, and you are busier than ever. Of course, this is good news—a busier job schedule generally means more revenue. But a growing business comes with new challenges: more clients and staff to manage, more invoices to send, and you want to ensure that you maintain the standards you’ve set for high quality and consistent service. As the manager of a service business, your job is to help establish processes so your growing company continues to provide high-quality service. As you take on more staff, you want to empower your staff to do a good job. And, you want to do all of this without creating unnecessary communication or busy work. So your task is to find efficient ways to empower your staff and reduce internal backlogs. This is where software can help you scale your business. Just like a good mechanic you need to equip your toolbox with the right tools. Poor tools do a poor job. Good employees with great tools get stuff done. Job forms is a Jobber feature that helps you get the right information to your team in the field. 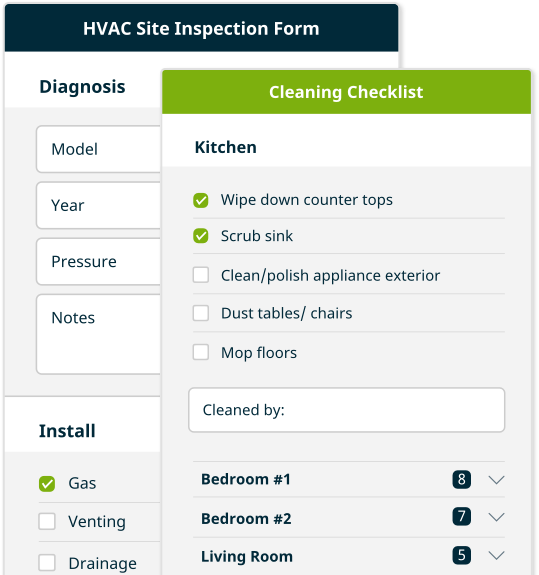 Common use cases are field checklists, site inspections, and service authorizations. Your forms are completely customizable: create different titles, checkboxes, text fields, and text boxes. Create specific forms for highly customized jobs, or create default forms applicable to all jobs that ensure consistency from job to job. Completed forms are stored in Jobber so you can access them at any time. Job forms are a simple way to effectively communicate with your staff out in the field. In other words, job forms give your staff the information they need to get the job done while saving you administrative time. A good team is at the core of any successful service business, however, finding, training, and retaining good team members is one of the biggest challenges that any service company faces. A good job posting and asking the right questions when hiring is key to finding employees, but once on your team, you want to make sure you do a good job of training new hires. Ultimately, trained employees will be a better representation of your company than untrained employees. When new employees go to a client’s home or a client site for the first time, there is a lot to remember. New employees will usually be going with a more experienced employee or manager, but you still want to give them the tools they need so they aren’t forgetting anything. Equip your team with up to date hardware and software for training. Foster a collaborative learning environment so that everyone can share and learn. This is where forms come in. Create a standard visit checklist for new team members and your team will know exactly what they need to do at each visit. Forms provide reminders and guidance, essentially forms empower your team to get the job done. The jobs your team needs to complete at a client site are normally a series of smaller tasks. Big jobs may require a lot for one employee to remember and checklists are a great way to break large jobs into smaller pieces. A residential cleaner tasked with cleaning a new client’s home may not know where to begin, but giving the cleaner a checklist for each room will help them know exactly what needs to be done. 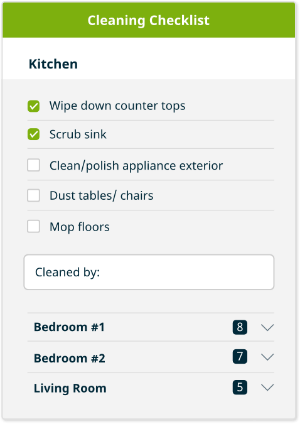 A cleaning checklist in Jobber using Job Forms. Checklists also act as a double check to ensure everything gets done at a client site. Trying to remember everything that a particular job requires is not only stressful, it’s difficult! Use site checklists to prevent your staff from forgetting any key tasks. Your team will run smoothly and you’ll keep your clients happy. Requiring your staff to fill out forms at a job site helps create consistency and keep your team accountable. 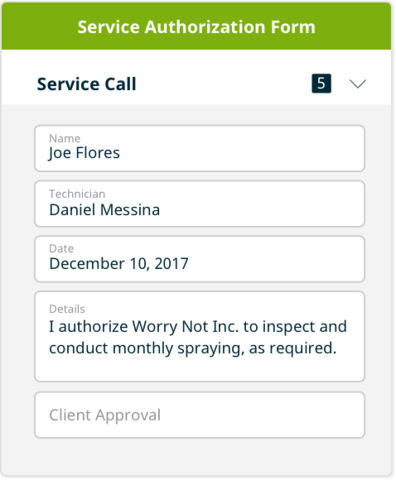 You can standardize site inspection forms, authorization forms, and to-do checklists so that they are consistent from job to job, no matter the employee filling out the form. There may be times when a customer calls you because a certain service was not done. In these instances, refer back to the Job Form to see if this task was completed or if proper notes were taken. This may be an opportunity to help train an employee and improve their attention to detail. Regardless, this is a great way to improve team accountability. Start using Job Forms today. For more information on how to setup Job Forms in Jobber, check out our help documentation or contact the success team at 1.877.721.1115.